Year: 1976. Running time: 106 minutes. Color. Italian with English subtitles. Directed by Pupi Avati. Starring Lino Capolicchi. Francesca Marciano, and Gianni Cavina. From Image Entertainment. Aspect ratio: 1.85:1. Italian film director Pupi Avati may not be as well known among horror aficionados as Mario Bava or Dario Argento, or even Lucio Fulci, but he has forged an impressive résumé, including the living dead classic Zeder, as well as the haunting horror thriller The House With Laughing Windows. Image Entertainment released Zeder on DVD in 1999 as part of their "EuroShock Collection," and now they have added The House With Laughing Windows to this same series. 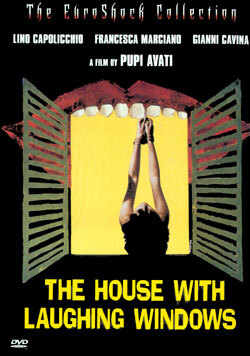 Never before released in America, The House With Laughing Windows has long been described by people "in the know" as one of the great Italian horror movies of the '70s, but until now, American fans of Italian horror could only satisfy their curiosity by turning to generally low-quality duplicates of European video releases. But now Image Entertainment steps in with an excellent letterboxed version, in Italian with English subtitles. Avati makes genuinely disturbing films. He isn't out to provide safe little thrill rides. He hones in on deep-seated fears and then through a relentless, somber, intense (and relatively humorless) approach, he strips away layers of a mystery to lay bare a truly horrifying revelation. He creates a brand of horror that sinks deep -- sometimes uncomfortably so -- into the viewer's psyche. Avati's movies don't provide the virtuosic technical innovations of Argento. Nor do they head for the violent extremes of Fulci. Instead, Avati's films move forward methodically, creating a palpable atmosphere of unspeakable horror. Avati wants to make his viewers uncomfortable, as if he has sunk treble hooks into their flesh. The House With Laughing Windows takes place in a remote Italian village where an art expert (Lino Capolicchio, probably best known for The Garden of the Finzi-Continis) is called to restore a decaying fresco in a local church. The fresco depicts the slaughter of St. Sebastian in graphic fashion, showing several large knives imbedded in his chest and stomach. Blood flows down his torso. Rumors suggest the artist worked from real-life models. As the restoration expert works on the fresco, he becomes obsessed with finding the truth behind the fresco's creation, leading him on a spiraling path toward his own destruction. Image Entertainment's DVD presentation of The House With Laughing Windows includes several extras, such as a lobby card gallery and a trailer, but the most substantial extra is a 16-minute featurette titled "25 Years of Cult" that includes interviews with director Avati and producer Antonio Avati, as well as composer Amedeo Tommasi. For fans of Italian horror, this disc is absolutely required viewing. The House With Laughing Windows is a near masterpiece. The House With Laughing Windows is now available on DVD from Image Entertainment in a widescreen transfer (1.85:1). Special features: a retrospective documentary, a theatrical trailer, a lobby card gallery, and filmographies. Suggested retail price: $19.95. For more information, check out the Image Entertainment Web site.